Olivier Babinet est venu présenter son film SWAGGER au Festival International du Film de San Francisco. C'est un film très touchant qui nous présente 11 adolescents d'Aulnay-sous-bois (93). Il a présenté le film à des élèves d'école publique de San Francisco, souvent défavorisés. Voila un entretien qu'il nous a accordé après le film dans la salle de projection du ROXIE de San Francisco, une salle de cinéma indépendant qui survit à San Francisco grâce aux fans. On vous conseille bien évidemment d'aller voir le film. On a beaucoup aimé. L'interview a été conduit par Nathalie Gobbi de LOSTINSF. Filmé et édité par moi-même, Olivier Bonin pour Madnomad Films. Caméra: Blackmagic URSA Mini Pro. Whole Foods Market employment policies are unique among large Wall Street companies. And it's easily reflected in what their employees (Team Members) have to say about their job there. Madnomad Films was asked to pick 10 people among 700 employees who had accepted to be interviewed and be profiled in these video portraits. It was a huge undertaking for which Whole Foods gave us a blank slate. The idea was to hear Team Members' personal stories and their relationship with the company. People come to Whole Foods for many reasons, often for the quality of the food they find there, but there are plenty of other good reasons, listen to the voices of the people who work there and filter out the noise from the news for a bit! Kickstarter == We all know Kickstarter, it's the #1 crowd-funding service, operated right here in San Francisco. And in San Francisco, the famous city by the bay, there are many landmarks that are slowly disappearing. One of them are those sculptures of "dachshung" dogs. 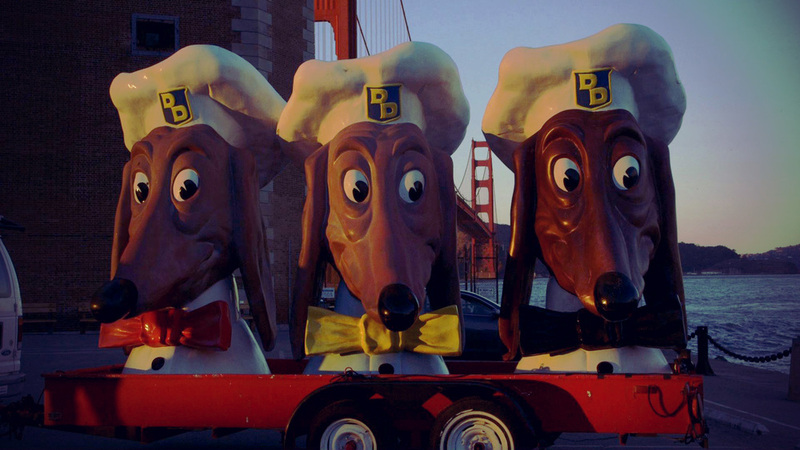 They were made the mascots of the Doggie Diner restaurant chain here in the SF bay area. With the last restaurant gone in 1986, this landmark is also leaving. John Law bought 3 of the Doggie Diner dogs back in the 80s, and has been taking them all around the bay area for 30 years, but the dogs are old and they're threatening to collapse. So he's starting a kickstarter campaign to restore them professionally before it's too late, so the bay area can enjoy for another 50 years. We made the video for the campaign, here it is. The project was successfully over-funded to $51K+. As a reminder sculptural project like these are very hard to fund with Kickstarter, now most funders are expecting something in return, something they can hold in their hands. The most successful projects are for products and essentially people are buying the products in advance, it's not really like supporting an artist or a film. But with the Doggie Diner it's about supporting a group of artists, and 3 sculptures of dogs, that most will only see passing by in front of them throughout the city of San Francisco. So it was a real success to be able to fund this project. The feedback was huge on the video. It conveyed everything people needed to know, but it also conveyed the un-explainable, that human connection that good filmmaking is able to create, so watch the video and let us know! Stanford University contacted us about a High School program they have developed over the past 4 years, and that is now complete. This is a curriculum to teach teenagers about Public Health and how to become advocate for their own community. The program is not standard class material as it directly gives tools to students so they can tackle real life issues in their own city. For this Stanford needed to make a video that would show potential teachers of the program how hands-on the program is and how it has been designed with students in mind. The video needed to not be a simple promotional/testimonial video, but needed to show teachers how much impact it has on students who take the class. So we embarked on an 8-month journey, between Stockton, Berkeley and Stanford to go in-depth and figure out who would be the best voices to present this great new program. Watch the video and see for yourself how hard work and upstream research can produce a very compelling video. Stanford University couldn't be happier. They now have a simple and effective tool to get attention from teachers who don't have much time in their hands. Madnomad Films has also done some work with Stanford STEP program, and SPIRE Stanford, an alumni group of professionals in Real Estate. Stanford Online High School is the most innovative form of education for High Schoolers. The students have live classes via Skype with university teachers so they each can progress at their own pace, and study subjects they are passionate about. This is the education of the future. But where Stanford High School really differentiate itself is in its body of students: They are all avid learners and share this educational experience together with other students who have the same passion for learning. Duration: 3'20" Alemany Farm is located on the south side of Bernal Heights in San Francisco. It is the largest food production site in the city. This sustainable urban farm is completely volunteer run and the work is done by whoever shows up on the bi-weekly word days. It donates 1/2 of its food production to families of the Alemany housing project with which they share their eastern fence. The farm is a tool to educate anyone interested in organic food production, and they run many workshops. It has been running since 1995, under the prior caretakers SLUG, and now since 2005 with Friends of Alemany Farm. The video was made to help them raise funds and apply for grants. Please support them, so they can continue. We have worked with Whole Foods Market to generate a series of videos that have been made available to all the team members. Essentially the videos offer insights into current and future programs that Whole Foods Market is working with, as well as short videos about their vendors. For now the series is for internal use only. Duration: 6:39 The WRIGHT Institute is a unique university located near UC Berkeley. They teach a Psychologya Master and Doctorate Program renowned around the country for its hands-on approach. From the start of the 1st years, students are placed into local agencies, jails, schools, health clinics and begin practicing alongside experienced clinical psychologists, and professors. The institute has a social agenda where all the patients the students follow are populations that would never have access to such therapy otherwise, even though they might be the ones who need it the most. Here is a short film we produced for them in the Madnomad Films style: a direct look at the program from the perspective of those who study and teach there. It shows what the Institute really is. Duration: 6'49" The WRIGHT Institute is a unique university located near UC Berkeley. They teach a Psychology Doctorate Program renowned around the country for its hands-on approach. From the start of the 1st years, students are placed into local agencies, jails, schools, health clinics and begin practicing alongside experienced clinical psychologists, and professors. The institute has a social agenda where all the patients the students follow are populations that would never have access to such therapy otherwise, even though they might be the ones who need it the most. Here is a short film we produced for them in the Madnomad Films style: a direct look at the program from the perspective of those who study and teach there. It shows what the Institute really is. Duration: 4'46" This is part of a series we produced for John Avalos who is running for Mayor in San Francisco. John is a very sincere person, and that surprised us for a politician. But after a few other videos, we got to know him and understood that the documentary form was the right approach to make a video about him for his campaign. 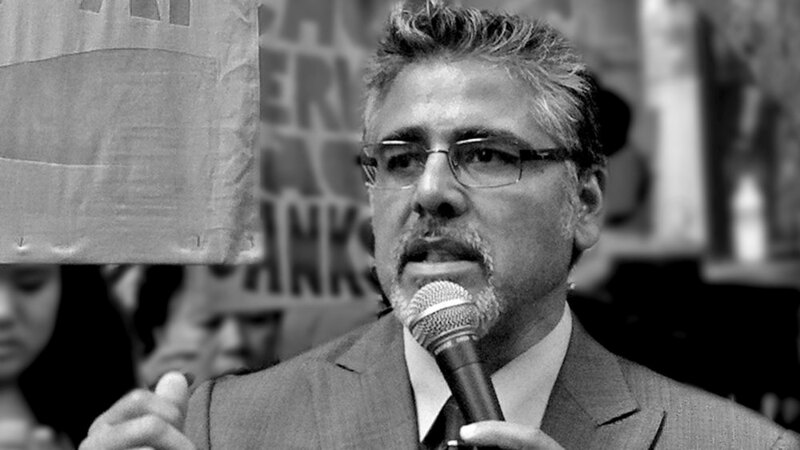 JOHN AVALOS has been endorsed by a landslide number of large local organizations in San Francisco. Read about their endorsement to understand why he is the right candidate to lead San Francisco today. He has also received the support of TOM AMMIANO, Aron Peskin, Davis Campos, Eric Mar, Ross Mirkirami. He was chair of the budget committee for 2 years and managed to balance the budget to keep vital services. The supervisors recognized his excellent handling of the budget, the negotiations, and his commitment to communities in San Francisco. 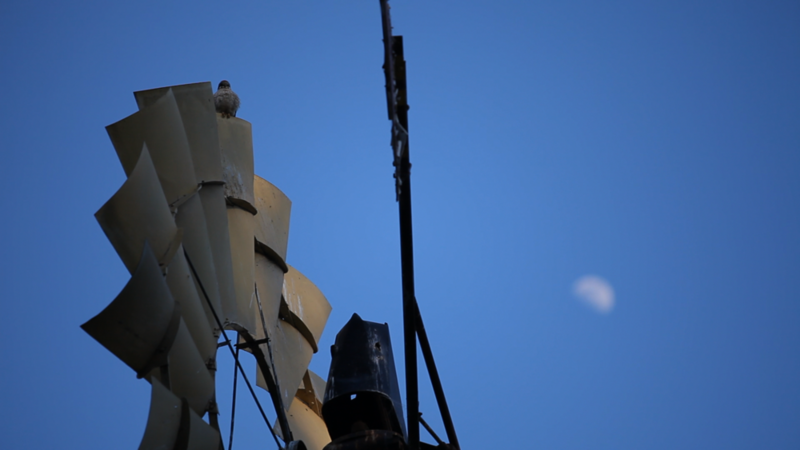 Duration: 2'23" Madnomad Films has been closely working with John Avalos, who is running for Mayor for San Francisco Municipal Nov 2011. We made this video in a week and once it was published it went viral. From the mouth of board members of the San Francisco Bike Coalition, the video made them endorse John Avalos as their #1 candidate. It actually made them change their mind!! That's a successful video. Duration: 5'08" Alexis Laurent latest artworks are a mix a live plants, and metal/wood elements. He calls them "Living Sculptures". Duration of trailer: 6' (Film duration: 75') After 4 years of work, Dust & Illusions is completed. The film explores 30 years of history of Burning Man all the way back to the late 70s into the origins of the event, with never seen footage of the Suicide Club, the Cacophony Society, and the early burns on San Francisco Baker beach. Twenty interviewees expose their views about the history of the event, and its evolution into a large festival. The film is the first to present Burning Man with a critical eye (not a negative one) and analyze how successful the event really is in its intention of recreating community and bringing art back to "ordinary" people. Watch it and be the judge, as the film doesn't try to draw conclusions one way or the other. Visit IMDB page. Join the mailing on the main website.